American workers saw the biggest bump in pay in nearly a decade last month amid a surprise late-summer hiring spree that offered no sign jobs markets could be cooling, the government reported Friday. The unexpected gains, which saw jobs sprout up in construction, transportation, wholesale trade, finance and health care, was a shot in the arm for President Donald Trump, who was beset this week by reports his staff had actively sought to undermine him. 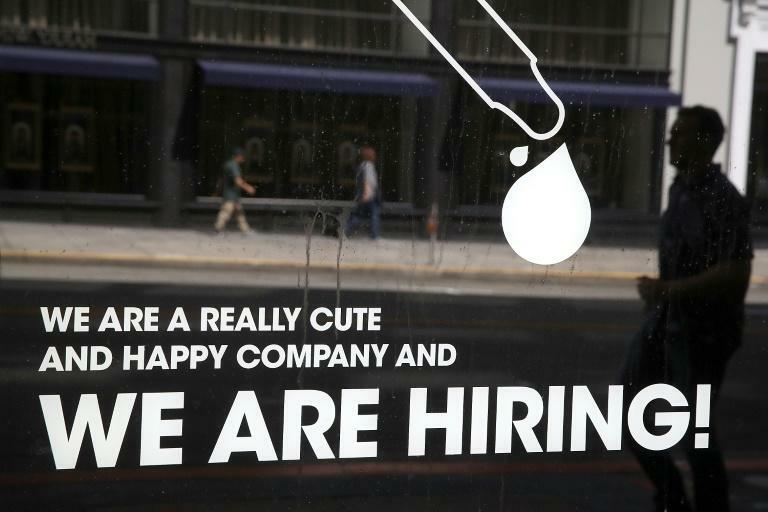 The US economy added 201,000 new jobs in August, well above analyst expectations, while the unemployment rate held steady at an already-low 3.9 percent. Meanwhile, a broader measure of unemployment, which includes underemployed and so-called discouraged workers who have given up looking for jobs, fell to 7.4 percent, the lowest level in 17 years. Ahead of crucial elections in November, the White House -- which had been at pains this week to counter reports of flagging wage growth -- welcomed the news. Top White House economic advisor Larry Kudlow hailed the surprise result, saying, "It shows the strength of the economy." He noted that "some people thought that the number was going to be 50,000 lower but it wasn't!" But the strong gain in pay will also solidify expectations for the Federal Reserve to continue raising interest rates this year to keep a lid on inflation, something that has repeatedly drawn Trump's ire. The August employment gain appeared even larger given a downward revision to July's comparatively weak numbers. "The labor market is tight but businesses are finding ways to get the workers they need. Job growth in August was solid once again," economist Joel Naroff said in a client note. The strong hiring report also brought average gains to 196,000 per month over the past year. Professional and business services added 53,000, bringing job gains for the sector to 519,000 since August of last year. The hiring momentum was not shared by all, however, as jobs in auto manufacturing, retail and utilities fell. The labor force participation rate and employment-to-population ratio also weakened slightly. Naroff cautioned that with the labor force growing only moderately and the participation rate among the population stagnant, "it will be hard to replicate the above-growth gains we had recently." The mining sector, an industry central to Trump's economic message of reviving the heavy industries of old, ticked slightly higher with 6,000 jobs added. The August result also is subject to revision in the coming months. But the bright spot for the month was surely the bump in average hourly worker pay, which jumped 10 cents over July's rate to add 0.4 percent, about double what economists had been expecting and the largest month-to-month increase since December. Analysts had warned that technical factors could produce a deceptively weak reading, since August had more total working days than prior months. Weak wage increases despite robust job growth had threatened to undermine the Republicans message ahead of November's mid-term elections that December's sweeping tax cuts would produce dividends for working Americans. Markets already expected the Fed to raise lending rates this month. But Friday's jobs report slightly raised odds on futures markets that the central bank would hike again in December in what would be the year's fourth increase. Wall Street took the jobs report as a grounds for caution due to the increased chances of a December hike, with the benchmark Dow Jones Industrial Average was slightly lower toward 1530 GMT.